If you follow me on Instagram (@ahairstory), then you may recall that in December 2012, I won a contest by CurlyGirlCollective. I won for a post on my two strand twists. The prize was an Eden Body Works prize basket. Fast forward to the first week in February when I finally received my prize basket after much back and forth about if it had been sent out or not. Granted, I’m not paying for it, but that’s a long time to wait, meanwhile other winners are posting their goodies. In any case, I finally receive my gift basket and instead of it having a shampoo as listed, it contained two conditioners. 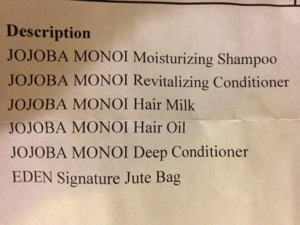 I was annoyed, but I emailed them and they shipped the shampoo to me with no problem. It’s in transit as we speak. 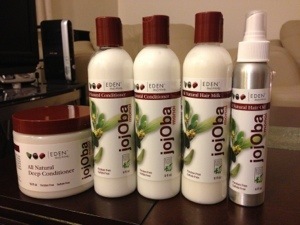 I tried them out last night for the first time, with the exception of the shampoo. The deep conditioner is very thick and rich. 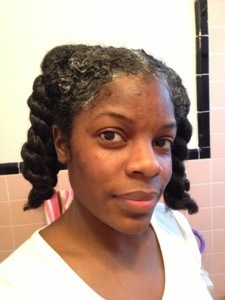 When I rinsed it out, my hair felt very soft and moisturized. I applied the hair milk leave in followed by the hair oil and proceeded to blowdry my hair. The hair oil is in a spray bottle, but it sprays in a stream instead of a spray so I sprayed it into my hand, then applied it to my hair. After blow drying, my hair felt a bit dry. I added more of the hair oil, but it didn’t seem to quench my hair thirst. Finally, I mixed extra virgin olive oil and (my lifesaver) Darcy’s Botanicals Pumpkin Seed Conditioner and my hair felt moisturized again. Not a bad line, but the products didn’t wow me. I really thought the conditioner would have. I’d definitely use what I have, but I doubt I’d buy it. Product Review: More Cream & Coco! I’ve really been neglecting my hair lately. I’ve been using the Selsun Blue shampoo and my scalp is soooo much better. I don’t know why I keep stopping. In any case, I washed my hair two weeks ago and after the first week, my scalp was still clean and my hair felt moisturized, so I skipped washing my hair last weekend. (That NEVER happens! Thanks to Selsun Blue, it was possible). 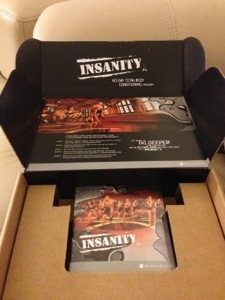 This past week I started doing the INSANITY Workout. It’s probably the hardest workout I’ve ever done. It’s for the next 60 days. Needless to say, my hair has been drenched with sweat everyday since last Sunday. I meant to wash my hair midweek, but I never got around to it. I FINALLY decided to get it done today. I continued my Pre-poo/Shampoo method with Selsun Blue Shampoo. 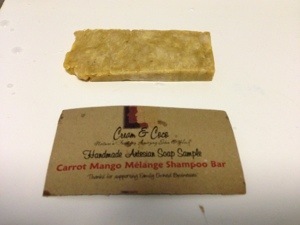 I washed that out, then used Cream & Coco’s Carrot Mango Melange Shampoo Bar. Shampoo bars are my new love. It’s very important to make sure that your hair and the shampoo bar are completely wet before using to avoid your hair sticking to the shampoo bar and causing possible damage. I haven’t had any problems with them. I love Cream & Coco’s shampoo bars because they smell awesome and they leave my hair feeling moisturized. My only wish is that the sample size bar was a little bigger, or maybe not as flat because it breaks easily. I would definitely buy Cream & Coco shampoo bars again. My favorite one was the Banana Smoothie, followed by Cocobutter milkshake. Following the shampoo session, I decided to try Cream & Coco’s Raspberry Ganache Deep Conditioner. The instructions say to break up the conditioner into pieces and add 1/4 cup boiling liquid which can be spring water, coconut milk, yogurt, milk or simple syrup of honey and water. I chose to add boiling water. The smell was amazing, like raspberries and chocolate. The consistency was a lot more watery than I expected, being that the instructions said it would get to the consistency of brownie mix. 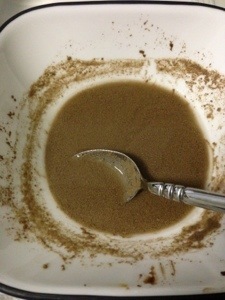 I also noticed that it didn’t dissolve as much as I expected. It always seemed like it was separating from the water a bit. I think it would have mixed better with something creamy like the yogurt or simple syrup mix. Needless to say, I was skeptical, but I applied it to my hair and left it on for the full 30 minutes as suggested. When I rinsed it out, my hair felt great, but was just a little more tangled than usual. It was very moisturized and felt coated. 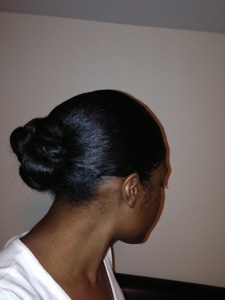 After drying my hair, it felt a lot fuller and like each strand was stronger. Who could complaint about that?! For those of you seeking fullness, this may be the product for you! I blow dried my hair and put it right back into a bun. Week 2 of INSANITY began today. Staying committed is the hardest part.